I adopted my dog, Ripple, at the ripe old age of 12. Ripple is a sweet old man, with plenty of character and personality, but he’s also got some problems. He suffers from severe cataracts that limit his vision, especially at night. He also has acute separation anxiety – something which is particularly common among Yorkshire Terriers. Short of having him follow me everywhere I go (which, obviously, isn’t tenable), there’s not a lot you can do about that. Here he is. Cute, isn’t he? 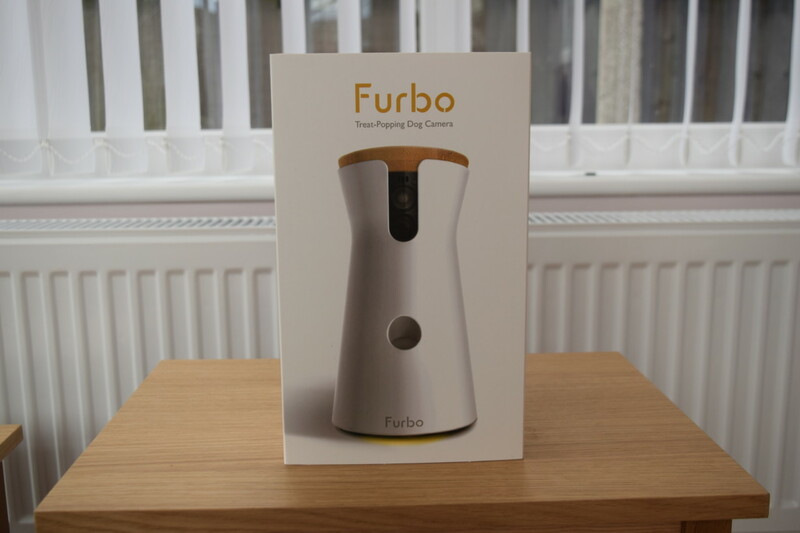 But I recently discovered that’s not entirely true after stumbling upon Furbo – a device that empowers you to soothe and entertain your dog, no matter where you might be. The device, which currently retails for $211 on Amazon, makes it possible to view your dog’s movements through its built-in HD video camera, as well as communicate with it, thanks to a microphone and deafeningly-loud speakers. It even lets you feed your pet pooch treats without having to touch them. 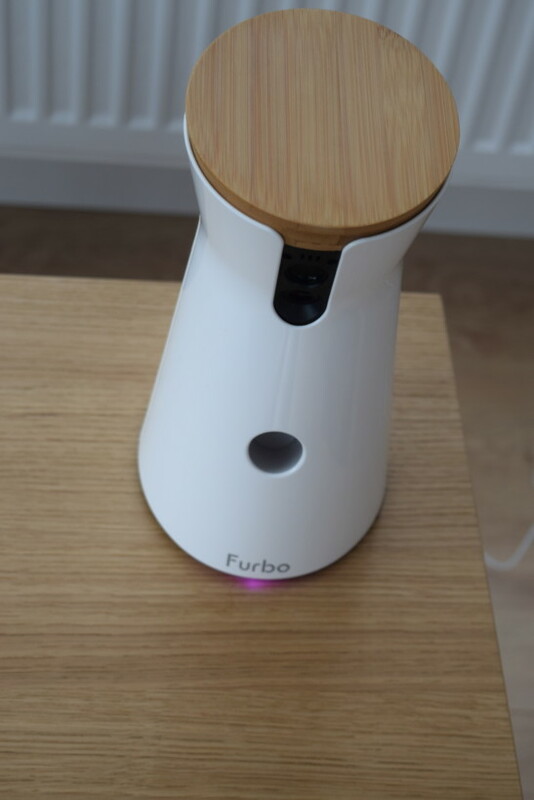 The Furbo isn’t a flashy-looking device. You could even describe it as ‘plain.’ Its body is a solid slab of white PVC, save for the parts that house the device’s webcam. Its lid – which you lift to load the device with dog treats – is a walnut-colored wood. But this isn’t a bad thing because it’s not supposed to stand out. It’s supposed to blend in. It’s no more obvious than an Ikea lamp, or a vase. 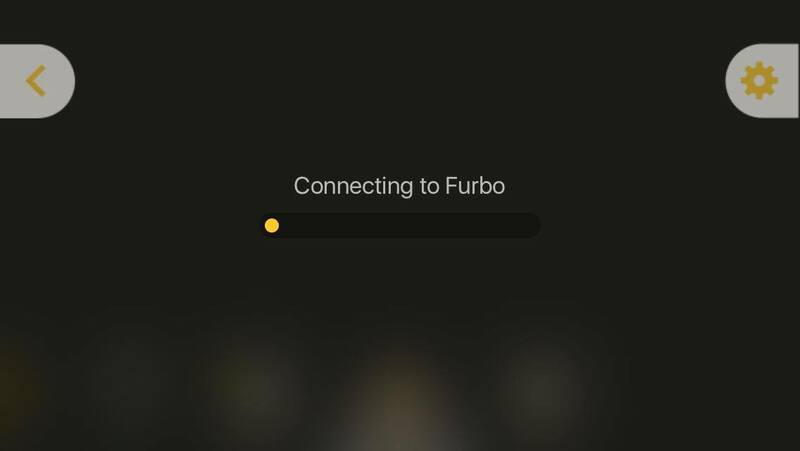 I’ve had the pleasure of playing with the Furbo for over a month now. At first, I was skeptical. While it’s true that dogs take comfort from the company of their owners, they don’t just merely associate it with a voice. For canines, it’s more visceral, and includes senses like smell and taste. 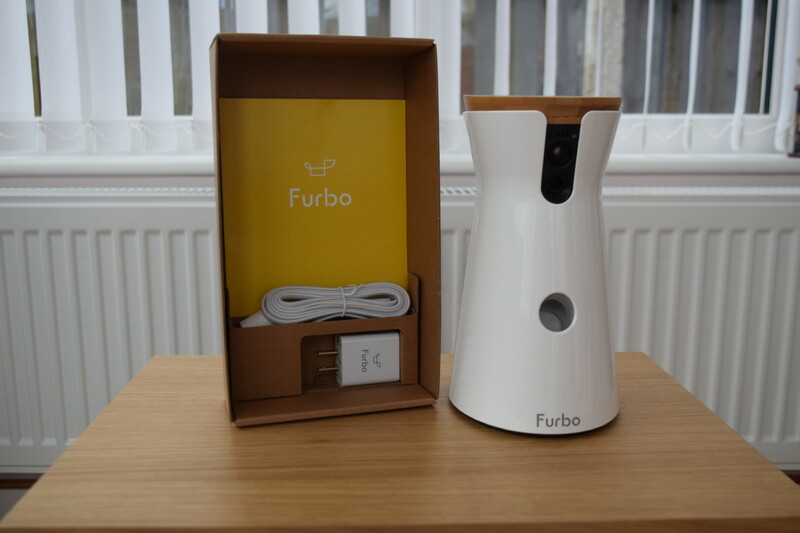 Although the Furbo is a rather ingenious device, it’s unable to replicate that. How could it? At first, I actually had concerns that it wouldn’t soothe, but rather amplify my dog’s immense anxiety from being alone. I was worried that by hearing my voice, but not seeing or smelling me, he might be frightened. Yorkshire Terriers might be the 27th most intelligent breed of dog, per canine psychology expert Stanley Coren, but I think the Internet of Things might be a little advanced for old Ripple. But my concerns were groundless. Although I’m not quite convinced my dog understands what the Furbo is, it’s clear he loves it. Despite his cataracts, he gets so happy when I use it to fling Pedigree Cheesy Bites at him. The best part of the Furbo is – hands down – the ability to load the device with treats. To dispense some, you open the app and swipe up, like you’re casting a Pokéball in Pokémon Go. Your mileage may vary though. The review unit that I received came with a pack of Canadian liver (foie – sorry, bilingualism is important) treats. These were perfectly square, and the device dispensed one at a time. But I also tried it with some Pedigree Cheesy Bites, which are Ripple’s favorite treat. These are smaller, and are rather oblong. As a result, the Furbo dispensed several at a time, throwing them across the room like buckshot out of a shotgun. In the below picture, you can see a dog treat mid-flight. This isn’t necessarily a bad thing, mind you. Ripple was thrilled to have several treats at a time, and he enjoyed hunting down the ones that’d fallen between crevices, and underneath the sofa. 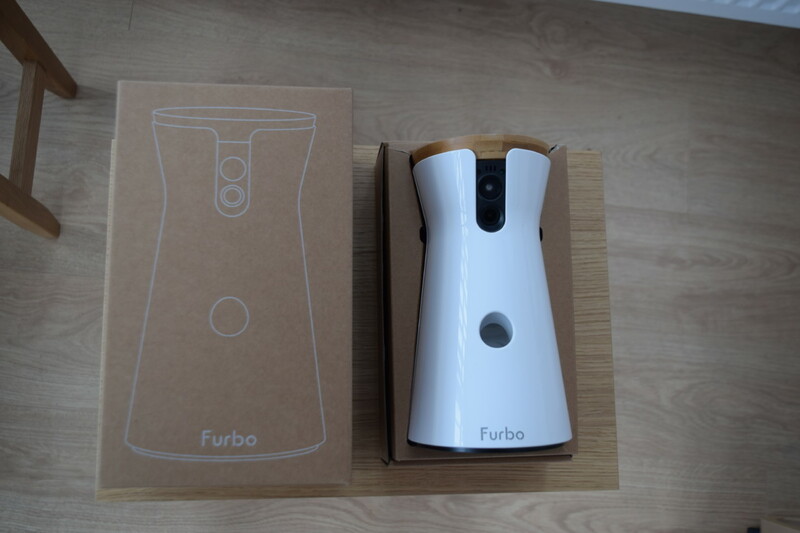 Setting up Furbo is trivially easy. Just turn it on and follow the instructions that come in the box. 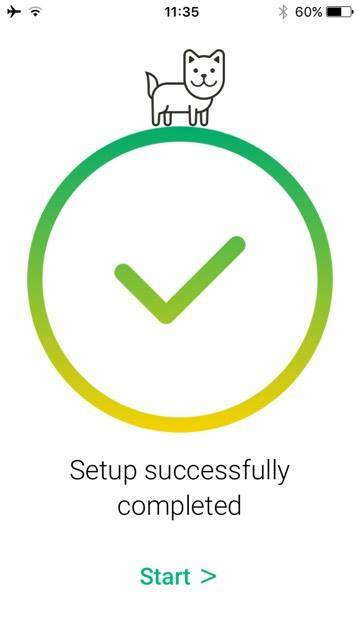 Setup was pretty painless, and took just five minutes. 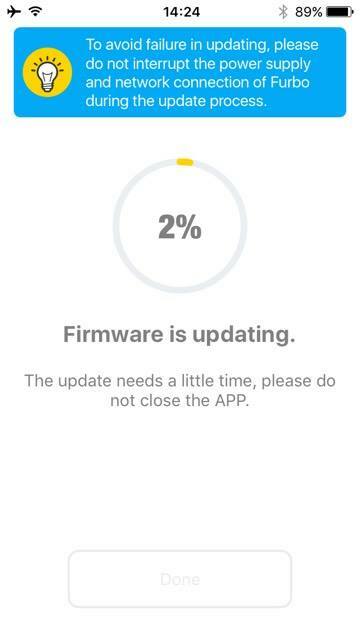 To control it, you’re going to need a smartphone running a relatively recent version of iOS or Android. Once you’re connected, you’ll be able to view a constant stream of everything happening in the room. 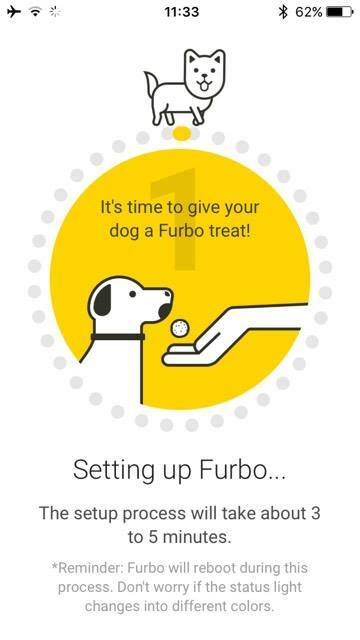 Pretty much everything you’ll want to do with Furbo – from speak to your dog, to throw treats – happens through this app. By default, the Furbo streams to your smartphone in 720p quality when connected to Wi-Fi. When you switch to cellular data, it goes a bit YouTube circa 2006, but it’s still very much watchable. Even at the lowest visual quality, I was still able to make out both of Ripple’s teeth. As mentioned before, you throw treats to your dog via this view by swiping upwards. Annoyingly, it doesn’t tell you when you’ve run out of treats, or how many you’ve got left. That’s my only – and biggest – complaint about the product. And of course, if you just want to admire your dog from a distance, you can mute your microphone and do just that. 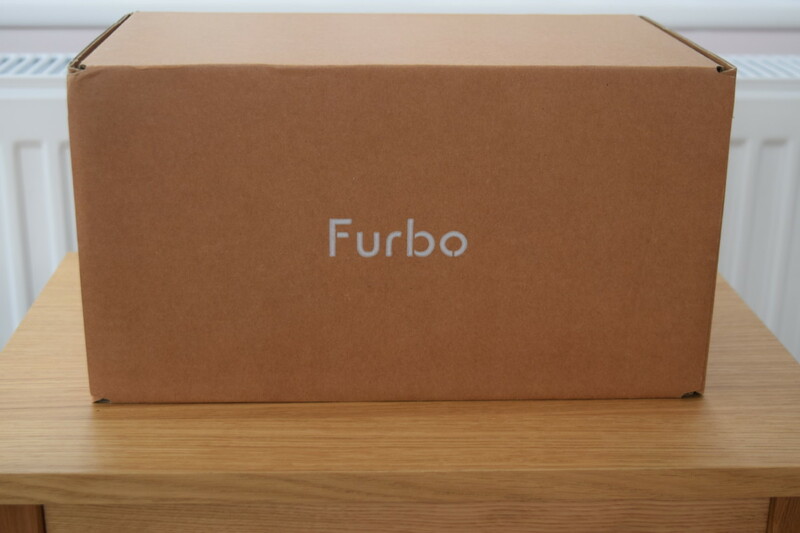 The makers of the Furbo aren’t selling a revolutionary new way to look after your dog. They’re selling confidence. The confidence to ensure that your dog isn’t anxious, or unhappy. The confidence that your prize pooch hasn’t just pizzled over your rug. When you think about it in those terms, the $211 asking price for the Furbo doesn’t seem too outlandish, does it?